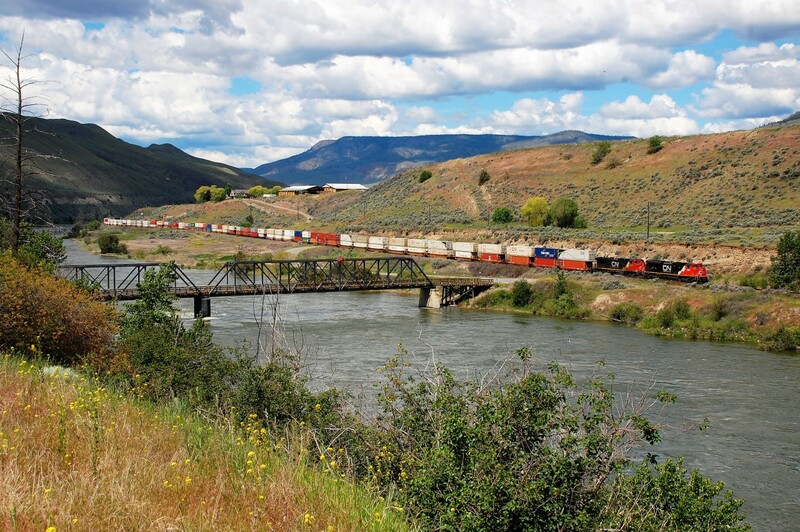 Railpictures.ca - Richard Hart Photo: An eastbound Intermodal is seen passing the single lane road bridge at Walhachin. A warm and wet spring led to very high water levels in B.C. this year as evidenced by this view of the Thompson River. | Railpictures.ca – Canadian Railway Photography – photographie ferroviaire Canadienne. Caption: An eastbound Intermodal is seen passing the single lane road bridge at Walhachin. A warm and wet spring led to very high water levels in B.C. this year as evidenced by this view of the Thompson River. As usual. Incredible scenery. Very nice effort.